As usual, click the picture for a bigger version. Ok ok, I'm mildly obsessed with this car. oh well. To be totally honest, part of this drawing is a cheat. 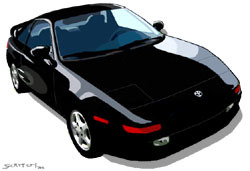 I started out with a digital picture of my car. Then I repainted over the whole thing in Photoshop, using some picked colors to use on the parts I was painting. Actually it was kinda hard picking out just the right shapes, and was time consuming.